He smiled, eyes glimmering, and offered a much shorter response, validating my musings. I used to get this type of feedback often. At the university, packing my semesters with 18 credits and reading for fun in my spare time. In Mexico and Central America, diving into grassroots development, far beyond the comforts of 1st world living. At the natural foods co-op, transforming my eating, drinking and exercise habits. In and out of my basement, running a small internet business. And, as in India, my years of ardent spiritual seeking. When people commented on my intensity and seriousness, I never quite knew what to do with it. My processing was that when I got into something, I got really into it. Passionate. Driven. Motivated. This always seemed to me to be a good thing. I thought if you’re actually going to do something, then give it 110%. For years and years, I proceeded like this. Subconsciously, a big thing that drove me to my teacher, Sayadaw U Tejaniya, was his approach to meditation: gentle, balanced and steady. Don’t power through life with brute force but rather learn to coast along with wisdom. It was a hard lesson for me to learn. I began my 21 month retreat with an incredible amount of seriousness. I would pop out of bed at 3:30am and get in roughly 16 hours of formal meditation before lying back down to sleep at night. At one point, I did an 18 day fast—10 of just water and 8 of a few pieces of fruit. For most of my time, I avoided speech and reading and anything else that might pull me from my formal practice. Thankfully, U Tejaniya was continually pointing me towards chilling out. Less formal meditation. More skillful talking. He kept probing me to figure out how to meditate without all the intensity. How to meditate while cleaning, reading, eating and other activities. He said, “just be aware.” Nothing more. It takes such a small amount of effort. After a year, I was beginning to internalize this lesson but then went off to a remote burmese monastery for five months of solo practice. With the idyllic conditions, my meditation practice grew very strong—but, I grew excited about my progress and slipped back into my old pattern of seriousness. On the walk back to my room, I had one of the bigger epiphanies of my life: the difference between seriousness and sincerity. I realized that the common point is direction. Imagine two students studying Spanish. Both the serious student and the sincere student diligently apply themselves to learning the grammar and speech. They both care, they both want to learn, they are both directed. However, along with that directedness, the serious student has an I have to get this mentality. Failure is not an option. They demand results of themselves. Until they have those results, they will not feel okay with themselves. The sincere student is not so hung up on results. Even if they aren’t doing so well objectively, they are thoroughly surrendered to the process of learning, rather than success or outcomes. They trust that if they keep at it, then whatever results are meant to come, will come. In other words, their sense of self-worth is not based on outcomes—they can feel okay with themselves no matter what their progress is. The ephiphany I had on that walk was a deep realization of how to maintain directedness without the craving of results. How to teach it to another human being? U Tejaniya’s method was to teach meditation fundamentals: a gentle, continuous awareness with the right attitude—not striving but rather diligent and steady. He tried to get students away from focusing on results, and release their intentions into the process. Of course, this all assumes a student is up for a long-term relationship with dedicated meditation practice. That approach is largely what’s worked for me, and so it’s also what I share with you. Although, here’s some nuances that seem important. Figuring out why we are so serious. In my decade of intensity, my why was that I was fundamentally not okay with myself. All those pursuits were seeking okayness in external things, like socially conscious work, monetary success, knowledge, health and wellness or even spiritual achievement. Unfortunately, none of them actually ever worked, which leads to the next point. Realizing that life is not a problem to be solved. We don’t find okayness or fulfillment through achieving, accomplishing or getting what we want. Personally, it was only through finding success in all those pursuits that I realized none of them offered a solution to my basic existential unrest. 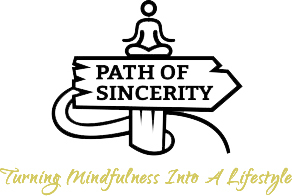 However, in gaining insight into these things, I didn’t slip into an apathetic void, but rather the meditation fundamentals I learned had taught me there is another way: the path of sincerity. After I had that epiphany, I still kept meditating as I had a strong sense of the value of meditation practice. In these past five months working on the farm, I feel highly directed but without all the background tension. I write very diligently, but I’m not particularly worried about being a great writer or communicating things perfectly. I don’t feel a need for results or success. I just do my best, and that’s enough. In summary, sincerity is about maintaining directedness but with a spirit of relaxation and self-okayness that isn’t dependent on results. If you find this topic pertinent and you connect with a mindfulness approach, I encourage you keep up a regular meditation practice and to reach out to me or any other experienced meditator who can help point you in a less serious, more sincere direction.